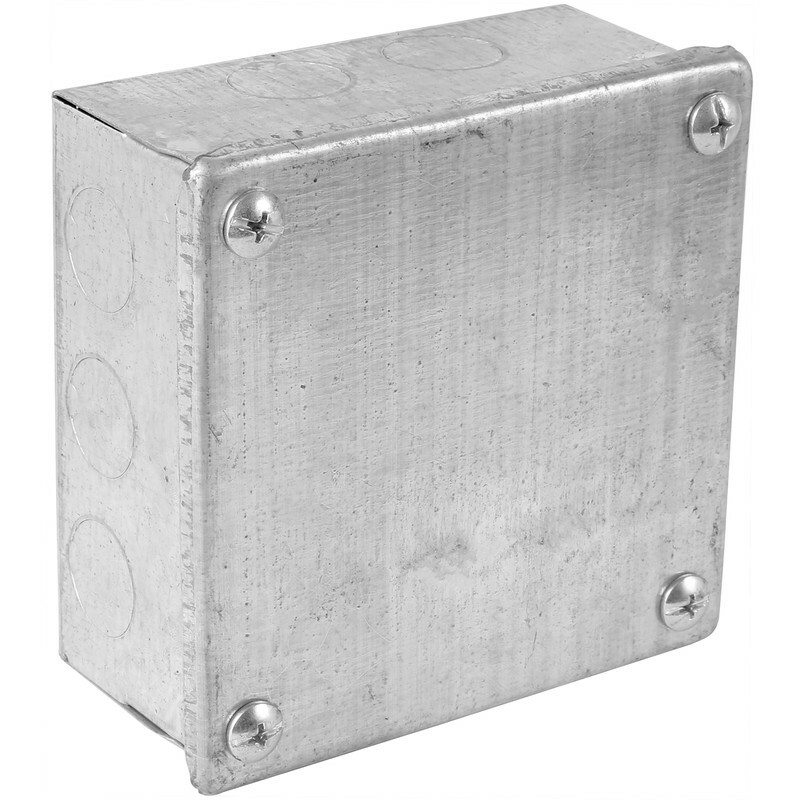 Metal Box with Knock Outs 4 x 4 x 2"
Metal Box with Knock Outs 4 x 4 x 2" is rated 3.8 out of 5 by 6. Rated 4 out of 5 by Welwyntone from Nice size box Although a little flimsy, this box is quite adequate for housing electrical items (transformers, LED drivers, etc.) to keep them well protected. Rated 4 out of 5 by BPTCP from Good Price This product is of the quality I expected and is very satifactory, in my opinion, especially at the price. Rated 2 out of 5 by Sparkmonkey from Very poor construction, but cheap. This boxs only good attribute is that its cheap. It is very poorly made. Barely square and it sprung out of square as i removed the lid. Flanges on the lid were badly made too. Would be ideal if out of sight. Rated 4 out of 5 by Evdama from does the job Fine for an access point /junction box buried in masonry and plaster or as an enclosure for a project.Three 20mm knockouts at the base of each side and knockout screwholes in the bottom.The sides are spot-welded at the top of the sides only so I'm guessing the IP rating is around zero.Lost one reviewers star for the absence of an earth terminal .I worked around this by adding an earth tab and locknut to the 20mm cable gland I was already using . Rated 4 out of 5 by Evdama from does the job Fine for an access point /junction box buried in masonry and plaster or as an enclosure for a project.Four 20mm knockouts at the base of each side and knockout screwholes in the bottom.The sides are spot-welded at the top of the sides only so I'm guessing the IP rating is around zero.Lost one reviewers star for the absence of an earth terminal .I worked around this by adding an earth tab and locknut to the 20mm cable gland I was already using . Rated 5 out of 5 by Bugsie from Well worth the money Best metal enclosure for the money. Could be IP66 but can be modified.